Agriculture has long played an important role in San Ramon Valley history. Agriculture has long played an important role in San Ramon Valley history. Before the Spanish came in 1769, native people made use of diverse natural resources. After Mission San Jose was founded in 1797, the Valley became mission land and herds of cattle and sheep from the mission and Mexican ranchos were grazed locally. Hides and tallow were exported in exchange for manufactured goods. With the Gold Rush and statehood, prospectors and new settlers arrived to find fertile land, mild weather and a surprising pattern of rainfall. From the 1850s to the 1950s several factors affected the Valley’s agricultural profile: technology (new inventions), power (horse, steam and gasoline), changing markets, business support and, of course, weather. Wheat was the major cash crop from the 1850s to 1900. Sailing ships from England brought goods to sell and returned with their holds filled with the Valley’s hard dry wheat. It brought premium prices at the Liverpool Corn Exchange. Farmers hauled their sacked wheat on freight wagons to wharves in Pacheco and Martinez where it was loaded onto ships. For their own use farmers had wheat ground into flour at the Pacheco Flour Mill, a long day’s drive on very dusty roads. When the Danville Branch of the Southern Pacific came to the Valley in 1891, this long haul was eliminated. Hay, from volunteer grasses or planted grain, was of almost equal importance to wheat. San Francisco was the major market for hay because of its liveries, the Cavalry at the Presidio and the many draft horses which supported docks and commerce. Scows, loaded with locally grown hay, plied the bay from docks in Pacheco and Martinez to the special hay wharf in San Francisco. Cattle and sheep, grazing the hills surrounding the Valley, provided another source of agricultural income. Several breeders raised purebred livestock, sold throughout California. Many farmers milked a few cows for butter and for cream to sell to local creameries for year-round income. There was a Grade A dairy in the Valley until 1967. Hogs were raised for meat since hams and bacon kept better than other meat without refrigeration. World wheat prices fell in the 1890s and local yields declined about the same time because of continuous cropping. Farmers diversified by planting fruit and nut trees, with the result that by 1920 the Valley floor was nearly covered with orchards. In 1873, Myron Ward Hall of Alamo grafted a Persian walnut (also known as English walnut) onto a native black walnut tree, producing an easily cracked, flavorful nut. Scions from that tree were used for the earliest walnut orchards. Hundreds of acres of these English walnuts were planted by the early 1920s and new orchards were still being planted after World War II. Growers established the Contra Costa Walnut Growers Association in Walnut Creek which graded, packaged and sold most of the County’s production. Travis Boone of Forest Home Farms and others provided harvesting, hulling and drying services into the 1960s. Fruit production also increased as prunes, pears, cherries and grapes were grown. Pears were planted on the Bishop Ranch in 1911. The ranch’s Bartletts were shipped directly from its railroad siding and became a well-known trademark in eastern markets. Prunes, dried in the summer sun, kept well but other fruits were sent to canneries in Walnut Creek and Hayward. Tomatoes, grown without irrigation, were sold to local canneries, including one in Walnut Creek. The industrial revolution changed farming methods considerably during the century. In the early 1850s wheat was harvested by hand with a scythe and threshed with a flail. The grain was separated from the chaff by tossing it into the wind. From the mid 1850s, reapers and headers were used to cut grain. It was then hauled to a stationary threshing machine which separated the kernels from straw and chaff. In the 1930s, combines—machines which moved through fields cutting and threshing at the same time—were developed. Farmers in this region were slow to convert to bulk grain handling and continued to use jute sacks into the 1950s. Teams of as many as 20 workhorses powered most farm machinery until about 1915, although some steam engines were used to run threshing machines from the late 1800s. Gasoline-powered tractors began to take over much of the heavy flat land work in the teen years. Tractors capable of working hillsides arrived in the ‘30s. Horses were used for light jobs, such as hay work, through World War II. Valley towns developed along with farms since farmers needed the special services of blacksmiths, wheelwrights and harness-makers. 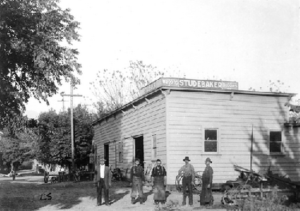 Blacksmiths were among the first businesses located in Alamo, Danville and San Ramon. They made and repaired farm equipment, shod horses, sharpened plows and did a variety of other jobs. Each town also had a general store with a post office. There too were livery stables and hotels, which made it possible for salesmen to arrive by stagecoach or train, rent rigs and visit farms. The Grange, churches, schools and fire stations provided meeting places. Gasoline stations sold and serviced cars and trucks. During the century from the 1850s to the 1950s the San Ramon Valley was part of the rural edge of the San Francisco Bay Area. Farmers and ranchers focused on agricultural production while local businesses supported them. The Valley provided a cornucopia of products, meriting the label “Garden of Eden” used by early pioneer Robert Baldwin.